MEDITERRANEAN SEA: NATO’s counter-terrorism Operation ACTIVE ENDEAVOUR flagship, ESPS CRISTÓBAL COLÓN, exercised with the United States Navy cruiser USS VELLA GULF, which is configured with the advanced AEGIS combat system to provide ballistic missile defence (BMD), earlier this month. 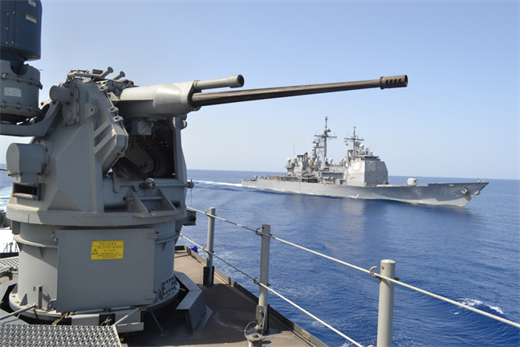 During the exercise, CRISTÓBAL COLÓN and VELLA GULF executed Air Defence manoeuvres eliminating simulated conventional air threats while the U.S. cruiser also engaged a simulated BMD threat. This exercise was made possible by the seamless integration of the AEGIS Combat Systems that both CRISTÓBAL COLÓN and VELLA GULF operate. Information on air threats were identified, analysed and passed between the two warships during the two-day exercise. CRISTÓBAL COLÓN, under the command of the Commander Enrique Núñez de Prado, has been the SNMG2 flagship since March 14, and will be relieved by USS LEYTE GULF, a United States Navy cruiser of the same class as VELLA GULF, as flagship later this week.